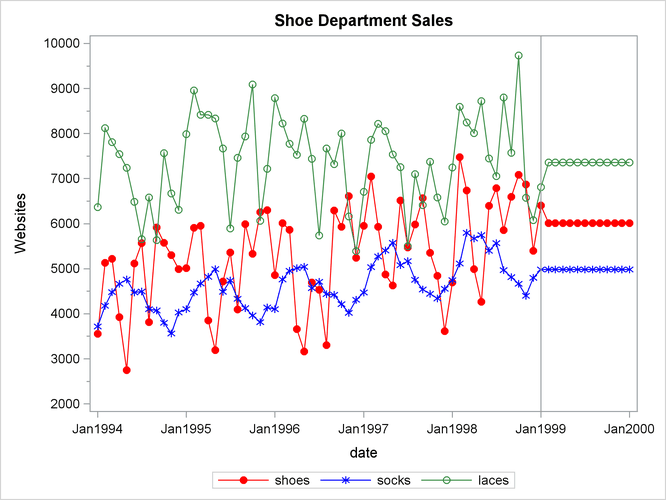 This example uses retail sales data to illustrate how the ESM procedure can be used to forecast time series data. The preceding statements generate forecasts for every numeric variable in the input data set SALES for the next twelve months and store these forecasts in the output data set NEXTYEAR. The plots are shown in Output 14.1.1. The historical data is shown to the left of the reference line and the forecasts for the next twelve monthly periods is shown to the right. The default simple exponential smoothing model is used because the MODEL= option is omitted on the FORECAST statement. Note that for simple exponential smoothing the forecasts are constant. In addition to forecasting each of the monthly time series, the preceding statements print the forecasts by using the Output Delivery System (ODS); the forecasts are partially shown in Output 14.1.2. This output shows the predictions, prediction standard errors, and the upper and lower confidence limits for the next twelve monthly periods.